In Johnny Mnemonic we see two different types of binoculars with augmented reality overlays and other enhancements: Yakuz-oculars, and LoTek-oculars. The Yakuza are the last to be seen but also the simpler of the two. They look just like a pair of current day binoculars, but this is the view when the leader surveys the LoTek bridge. I assume that the characters here are Japanese? Anyone? Once Johnny has installed his motion detector on the door, the brain upload can begin. Johnny starts by opening his briefcase and removing various components, which he connects together into the complete upload system. Some of the parts are disguised, and the whole sequence is similar to an assassin in a thriller film assembling a gun out of harmless looking pieces. It looks strange today to see a computer system with so many external devices connected by cables. We’ve become accustomed to one piece computing devices with integrated functionality, and keyboards, mice, cameras, printers, and headphones that connect wirelessly. When it refused to give up authority, the Captain wrested control of the Axiom from the artificial intelligence autopilot, Otto. Otto’s body is the helm wheel of the ship and fights back against the Captain. Otto wants to fulfil BNL’s orders to keep the ship in space. As they fight, the Captain dislodges a cover panel for Otto’s off-switch. When the captain sees the switch, he immediately realizes that he can regain control of the ship by deactivating Otto. After fighting his way to the switch and flipping it, Otto deactivates and reverts to a manual control interface for the ship. The panel of buttons showing Otto’s current status next to the on/off switch deactivates half its lights when the Captain switches over to manual. The dimmed icons are indicating which systems are now offline. Effortlessly, the captain then returns the ship to its proper flight path with a quick turn of the controls. One interesting note is the similarity between Otto’s stalk control keypad, and the keypad on the Eve Pod. Both have the circular button in the middle, with blue buttons in a semi-radial pattern around it. Given the Eve Pod’s interface, this should also be a series of start-up buttons or option commands. The main difference here is that they are all lit, where the Eve Pod’s buttons were dim until hit. Since every other interface on the Axiom glows when in use, it looks like all of Otto’s commands and autopilot options are active when the Captain deactivates him. The panel is in a place that is accessible and would be easily located by service crew or trained operators. Given that the Axiom is a spaceship, the systems on board are probably heavily regulated and redundant. However, the panel isn’t easily visible thanks to specific decisions by BNL. This system makes sense for a company that doesn’t think people need or want to deal with this kind of thing on their own. Once the panel is open, the operator has a clear view of which systems are on, and which are off. The major downside to this keypad (like the Eve Pod) is that the coding of the information is obscure. These cryptic buttons would only be understandable for a highly trained operator/programmer/setup technician for the system. Given the current state of the Axiom, unless the crew were to check the autopilot manual, it is likely that no one on board the ship knows what those buttons mean anymore. Thankfully, the most important button is in clear English. We know English is important to BNL because it is the language of the ship and the language seen being taught to the new children on board. Anyone who had an issue with the autopilot system and could locate the button, would know which button press would turn Otto off (as we then see the Captain immediately do). Considering that Buy-N-Large’s mission is to create robots to fill humans’ every need, saving them from every tedious or unenjoyable job (garbage collecting, long-distance transportation, complex integrated systems, sports), it was both interesting and reassuring to see that there are manual over-rides on their mission-critical equipment. The opposite situation could get a little tricky though. If the ship was in manual mode, with the door closed, and no qualified or trained personnel on the bridge, it would be incredibly difficult for them to figure out how to physically turn the ship back to auto-pilot. A hidden emergency control is useless in an emergency. Hopefully, considering the heavy use of voice recognition on the ship, there is a way for the ship to recognize an emergency situation and quickly take control. We know this is possible because we see the ship completely take over and run through a Code Green procedure to analyze whether Eve had actually returned a plant from Earth. In that instance, the ship only required a short, confused grunt from the Captain to initiate a very complex procedure. Security isn’t an issue here because we already know that the Axiom screens visitors to the bridge (the Gatekeeper). 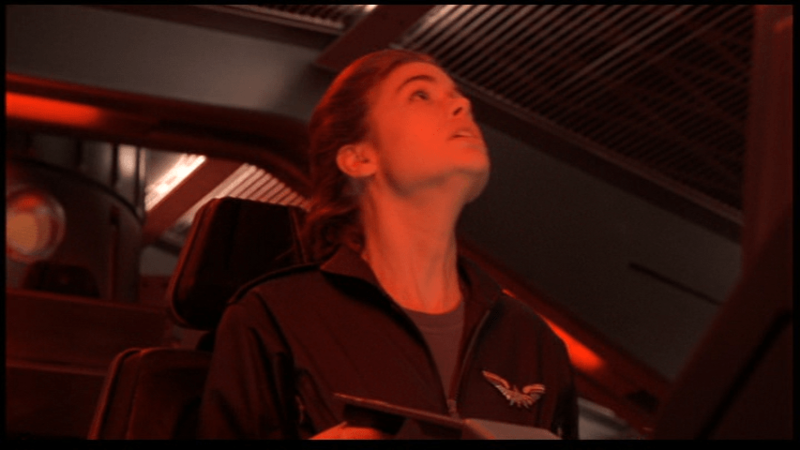 By tracking who is entering the bridge using the Axiom’s current systems, the ship would know who is and isn’t allowed to activate certain commands. The Gatekeeper would either already have this information coded in, or be able to activate it when he allowed people into the bridge. For very critical emergencies, a system that could recognize a spoken ‘off’ command from senior staff or trained technicians on the Axiom would be ideal. The hidden door, and the obscure hard-wired off button continue the mission of Buy-N-Large: to encourage citizens to give up control for comfort, and make it difficult to undo that decision. Seeing as how the citizens are more than happy to give up that control at first, it looks like profitable assumption for Buy-N-Large, at least in the short term. In the long term we can take comfort that the human spirit–aided by an adorable little robot–will prevail. So for BNL’s goals, this interface is fairly well designed. But for the real world, you would want some sort of graceful degradation that would enable qualified people to easily take control in an emergency. Even the most highly trained technicians appreciate clearly labeled controls and overrides so that they can deal directly with the problem at hand rather than fighting with the interface. After Wall-E and Eve return to the Axiom, Otto steals the Earth plant and has his security bot place it on a lifeboat for removal from the ship. Wall-E follows the plant onboard the pod, and is launched from the Axiom when the security bot remotely activates the pod. The Pod has an autopilot function (labeled an auto-lock, and not obviously sentient), and a Self-Destruct function, both of which the security bot activates at launch. Wall-E first tries to turn the auto-pilot off by pushing the large red button on the control panel. This doesn’t work. Wall-E then desperately tries to turn off the auto-destruct by randomly pushing buttons on the pod’s control panel. He quickly gives up as the destruct continues counting down and he makes no progress on turning it off. In desperation, Wall-E grabs a fire extinguisher and pulls the emergency exit handle on the main door of the pod to escape. There are two phases of display on the controls for the Auto-Destruct system: off and countdown. In its off mode, the area of the display dedicated to the destruct countdown is plain and blue, with no label or number. The large physical button in the center is unlit and hidden, flush with the console. There is no indication of which sequence of keypresses activates the auto-destruct. When it’s on, the area turns bright red, with a pulsing countdown in large numbers, a large ‘Auto-Destruct’ label on the left. The giant red pushbutton in the center is elevated above the console, surrounded by hazard striping, and lit from within. The odd part is that when the button in the center gets pushed down, nothing happens. 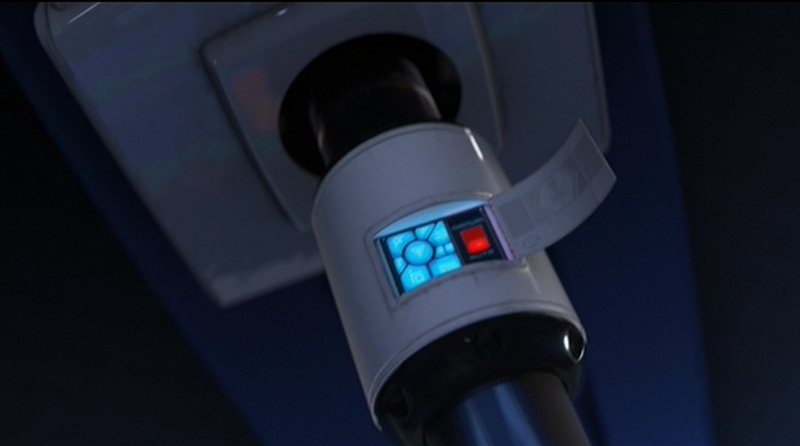 This is the first thing Wall-E does to turn the system off, and it’s has every affordance for being a button to stop the auto-destruct panel in which it sits. It’s possible that this center button is really just a pop-up alert light to add immediacy to the audible and other visual cues of impending destruction. If so, the pod’s controls are seriously inadequate. Wall-E wants to shut the system off, and the button is the most obvious choice for that action. Self-destruction is an irreversible process. If accidentally activated, it is something that needs to be immediately shut off. It is also something that would cause panicked decision making in the escape pod’s users. Of course this is just part of the fish-out-of-water humor of the scene, but is there a real reason it’s not responding like it obviously should? One possibility is that the pod is running an authority scan of all the occupants (much like the Gatekeeper for the bridge or what I suggested for Eve’s gun), and is deciding that Wall-E isn’t cleared to use that control. If so, that kind of biometric scanning should be disabled for a control like the Anti-Auto-Destruct. None of the other controls (up to and including the airlock door exit) are disabled in the same way, which causes serious cognitive dissonance for Wall-E. The Axiom is able to defend itself from anyone interested in taking advantage of this system through the use of weapons like Eve’s gun and the Security robots’ force fields. Anything that causes such a serious effect should have an undo or an off switch. The duration of the countdown gives Wall-E plenty of time to react, but the pod should accept that panicked response as a request to turn the destruct off, especially as a fail-safe in case its biometric scan isn’t functioning properly, and there might be lives in the balance. This escape pod is meant to be used in an emergency, and so the automatic systems should degrade as gracefully as possible. While beautiful, extremely well grouped by apparent function, and incredibly responsive to touch inputs, labels would have made the control panel usable for even a moderately skilled crewmember in the pilot seat. Labels would also provide reinforcement of a crew member’s training in a panic-driven situation. A design should empower the people using it, and provide reinforcement to expert training in a situation where memory can be strained because of panic. The escape-pod has many benefits: clear seating positions, several emergency launch controls, and an effective auto-pilot. Adding extra backups to provide context for a panicked human pilot would add to the pod’s safety and help crew and passengers understand their options in an emergency.